As anti-Islamist violence erupted across Turkey, another threat to the ambitions of Recep Tayyip Erdogan was the rising tension between Christians and majority Muslims. The problem stands out on Halki, home to a venerated and endangered Orthodox seminary. “You can’t come in,” snaps the moustachioed guard in front of the gates. “Why not?” I ask. Back at the Patriarchate in Istanbul, Father Nephon, an archimandrite or senior abbot, had said I didn’t need permission to visit the great Orthodox seminary. Just go, he had advised, blithely. So I and my guide, a professor at an Istanbul university, have taken the 90-minute ferry ride across the Sea of Marmara to the island of Halki (known in Turkish as Heybeliada). We have toiled up Halki’s “Hill of Hope”, past Ottoman-era clapboard summer houses built by Greeks and now inhabited by Turks. The air reeks of horse manure: horse and carriage and bicycle are Halki’s only transport, and as we near the forested summit, two chestnuts trot by. They tow a carriage bearing five Orthodox clerics wearing black robes and cylindrical black hats draped in black veils. Clearly we are on the right road. Rising from lovingly tended flower beds is a vast 19th-century edifice, its brick and stone walls and terracotta roof an architectural nod towards Byzantium. I am following in the footsteps of my great-grandfather George Bowen, who came here in 1848 before setting off to research his Murray’s Handbook, the first guidebook to modern Greece. Bowen wondered when the newly independent Greeks – who had recently wrested some of their territory from under the “Ottoman yoke” – would again fly their flag from the dome of Hagia Sophia, their great basilica, seized by the conquering Turks in 1453. Instead the opposite happened and Turkey’s ethnic Greek population, known as the Rum, has plummeted from 1.8 million in 1912 to roughly 2,500 today. Greeks have lived here since founding the colony of Byzantium in the 7th century BC. Now, according to a 2009 report for the European Commission on Human Rights, “urgent action is needed if [the Rum community] is to survive”. Halki Seminary, at the centre of political wrangling for four decades, symbolises that struggle for survival. It was founded in 1844 by the Ecumenical Patriarchate of Constantinople in the Eastern Orthodox Church and its alumni include some of the world’s leading churchmen. However, in 1971 the secular Turkish government shut the seminary down. 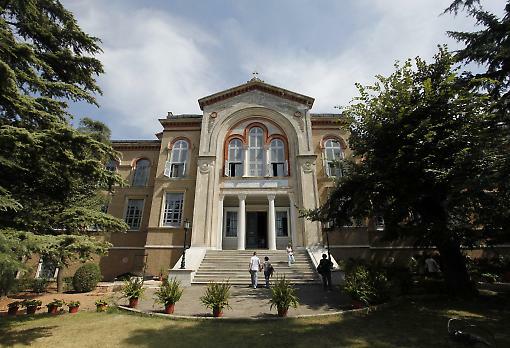 Priests of the patriarchate, who by law must be Turkish citizens, now have nowhere to train. Without priests, the survival of the Orthodox Church here is threatened. This is a bedrock of Christendom. Much of the New Testament originated in what is now Turkey; it was also the site of the great ecumenical councils between the 4th and 8th centuries, where the Christian doctrines were thrashed out. These include the Nicene Creed, the profession of faith recited every Sunday in churches of almost all denominations throughout the world. Halki’s closure remains a festering sore in relations not only between Turkey and its Rum minority, but between Turkey and the European Union and the United States. However, in March 2012, when President Barack Obama raised the issue, Prime Minister Recep Tayyip Erdogan of Turkey said that, for him, it would not be a problem. Since then nothing has happened, but in January this year, perhaps as a sign of good faith, the state agreed to return 470 acres of surrounding forest to the seminary, to date the largest return of property to any minority in Turkey. I have come to find out more. “Let’s go inside,” I suggest, heading for the marble entrance steps. The guard is looking the other way. My friend hesitates. Living and working in Turkey, in many ways a police state, he has the misfortune of knowing the rules. “Keep walking,” I urge him, resolutely. We ignore a shout from the guardhouse. The professor, nervous but curious, follows me through a portico into the stone-flagged hall, then up a grandiose staircase. A door left ajar gives a glimpse of a crimson-carpeted chamber, its panelled walls hung with icons and portraits of bearded patriarchs. On hearing voices, my guide peers inside and reports ancient clerics sipping tea, like a coven of wizards. Here are the men we’d seen in the horse-drawn carriage. “Hey!” A priest swathed in black robes, his black hair knotted at the nape of his neck, strides towards us from a side corridor. Expecting to be ejected on the spot, I explain that I’ve come from England and that I am tracing the steps of my great-grandfather. “Oh yes,” the young man smiles, shaking my hand. “Father Nephon at the Patriarchate told me about you. I’m Father Samuel. Welcome.” At that moment the guard arrives, panting, at the top of the stairs. As Father Samuel leads us away, the guard can only give us a furious look. I give him a triumphant one in return. Father Samuel steers us out on to a terrace where we are dwarfed by the building’s two rear wings. These once housed a boys’ secondary boarding school, the monastery and the seminary, with the attendant infirmary, library, kitchens and dormitories, now closed except to host occasional conferences. The building’s grandeur reveals the scale of 19th-century Orthodox ambitions, which coincided with Ottoman reforms that allowed the Church new freedoms after centuries of oppression. Father Samuel, his black habit flapping round his slender frame, shows us into a classroom. It has a blackboard and rows of oldfashioned lidded desks incised with graffiti, mothballed for 40 years. These rooms once echoed with the shouts of 125 students who studied such arcane subjects as dogmatics, patristics, liturgy, philosophy, theology and biblical studies. Of Halki’s 930 graduates, 343 became bishops and 12 became patriarchs – heads of churches. Basil Anagnostopoulos, now 90, was a seminary graduate who returned in 1950 as professor of patristics, the study of the early Church fathers, until the closure in 1971 forced his early retirement. His former students include parish priests, theology professors and diocesan bishops in Europe and the US, as well as the current Orthodox Archbishop of Australia and the Metropolitan of New Zealand. He recalls that one of his most brilliant students was Demetrios Archondonis, now known as His All-Holiness Bartholomew I, 270th Ecumenical Patriarch of Constantinople, whose jurisdiction covers not only the Rum and parts of Greece, but also the estimated five-million-strong Greek diaspora, mainly in the US, Britain, Australia and Germany. Bartholomew is also the foremost spiritual leader of the world’s 300 million Orthodox faithful, because although there are other patriarchs, he is considered “first among equals”. He has to watch his words. Turkey has a reputation of being unfriendly to its minorities, and in a loose interpretation of anti-terrorist laws, directed nominally against the Kurds, government critics in Turkey are increasingly silenced. Individuals can be penalised for making “propaganda” – which could include campaigning for Halki. In October 2012 the Committee to Protect Journalists, an independent non-profit organisation, reported that there were 76 journalists in prison in Turkey, more than in any other country – almost twice the number in Iran (42) and three times the number in China. Prof Anagnostopoulos’s son Panos, who grew up on Halki but now lives in London, can be more outspoken. “Halki was shut for political reasons,” he says, “when anti-Greek feeling arising from the Cyprus conflict was at its height.” Some believe it has remained closed because the Patriarchate is suspected of being a nest of spies with a secret weapons cache, spies who continue to espouse the Megali Idea – the Great Idea to reclaim all former Hellenic lands for Greece under a megastate, with Constantinople as its capital. The Rum have long been caught in the historic animosity between Greece and Turkey. Following the exchange of Greek and Turkish populations in 1923, 200,000 Rum were permitted to remain, mainly in Istanbul and on the Aegean islands of Tenedos and Imbros, where Patriarch Bartholomew was born. Their presence was the last remnant of Ottoman cosmopolitanism, in which the streets bustled with Greeks, Turks, Jews, Armenians, Arabs and Levantines, who coexisted with their different languages, dress, foods, businesses, schools and places of worship. That cosmopolitanism has almost vanished. Considered less as Turkish citizens than as an outpost of Greece, the Rum have endured what the Ecumenical Federation of Constantinopolitans, a moderate group that meets with Turkish ministerial officials to solve Rum-minority issues, describes as “systematic discrimination and harassment”. The Cyprus conflict of the 1950s to the 1970s provoked violent, governmentsponsored anti-Rum riots and 2,000 Rum buildings, including churches, schools, hospitals and 24 monasteries – some of them over a thousand years old – were confiscated. Most were sold or demolished. Father Samuel’s family was forced to leave Turkey, so he studied for the priesthood in Greece. Without Turkish citizenship, he is forbidden by law from working here as a priest. Yet, no priests can train here. Without priests, the Church cannot function. And without priests, there is no pool from which to choose the next patriarch, who must also be born in Turkey. When the 73-year-old Bartholomew retires or dies, it may prove hard to find his successor. Metropolitan Elpidophoros Lambriniadis is tipped as a possible patriarch, but he had to be persuaded to return from abroad, do national service and regain his Turkish citizenship. In future the Church may not be so lucky. I wonder how many Rum would want to study Orthodox theology, given that as few as 2,500 remain and their average age is 65. During the 1960s Panos Anagnostopoulos’s Rum primary school on Halki island had 60 pupils: since then, dwindling numbers have forced its closure, and throughout Turkey only 120 Greek-speakers remain in Rum-minority schools. Following the Istanbul riots of 1955, the Rum fled and others were deported. In 1964, Anagnostopoulos’s uncle, along with 12,000 other Turkish citizens who for historical reasons held Greek passports, was given 48 hours to leave the country, taking one suitcase and $22. His home was confiscated. His wife, who had a Turkish passport, had to sell their possessions and join him to begin a new life in Athens, where they were not particularly welcome. Their story is echoed in the 2003 Greek feature film Politiki kouzina (A Touch of Spice), in which one character says forlornly that they have gone from being Greeks in Turkey to being Turks in Greece. Meanwhile, the population of Turkey has multiplied fivefold since 1912, to just under 75 million; half of that is under the age of 28, and it is estimated that 99 per cent of Turks are Muslim. Since the foundation of the secular Republic of Turkey in 1923, religion in public life has often been zealously suppressed and Islamic clothing banned from the universities and the professions. However, internal migration from the countryside has imported rural and often more fervently Islamic values into the cities. Along with rebuffs by the EU, reaction against years of authoritarian secularism and a swagger born of a booming economy that has avoided the worst of the global credit crisis, this has led to increased nationalism and helped to reorient Turkey away from Europe – its historical focus – towards the Middle East and Africa. The shift is epitomised by the hijab controversy. Secularists argue that the headscarf is retrogressive and oppressive, but many women, including articulate professionals, have been fighting for the right to cover their heads. In crowded Beyoglu, the centre of Istanbul nightlife, I am surprised by the number wearing full-length trench coats, hijabs and even the face-covering niqab. This is reflected at the highest level of government, which since 2002 has been led by the pro-Muslim Justice and Development (AK) Party. In 1999 Recep Tayyip Erdogan, the then mayor of Istanbul, spent four months in prison for reciting a poem that his secularist accusers considered militantly Islamic; in 2003 that same mayor became prime minister. Now his wife wears the hijab at state events, something that would have horrified Mustafa Kemal Atatürk, Turkey’s founding father. Erdogan’s critics, many of whom have been imprisoned for supposed anti-government conspiracies, fear that since winning the 2011 elections with nearly 50 per cent of the vote he faces little opposition to a suspected secret agenda to replace Atatürk’s secular system with an Islamic one. They view the conservative “Imam-Hatip” schools as a sign of this. Originally set up to train imams, they provide religious instruction, including recital of the Quran, along with general schooling. Erdogan attended an Imam-Hatip school in Istanbul. Even as Halki Seminary remains closed, recently some 67 Imam-Hatip schools have opened in Istanbul alone. Since March last year, children have been able to join them from the age of 11 instead of 15 as before. Ali Boga, an AKP member of parliament, describes the expansion as the beginning of a broader movement. “We have the chance to turn all schools into Imam-Hatip schools,” he says. Erdogan hopes that they will breed a “pious generation”. The shrinking Rum and growing Muslim numbers notwithstanding, Panos Anagnostopoulos insists that Halki would have no trouble filling its classrooms. “This is more than a local issue. Anybody under the Patriarchate’s jurisdiction was allowed to come and study here. At its height 90 per cent of the students came from abroad, from as far away as the US, Egypt and Ethiopia.” For the worldwide Orthodox community, nowhere else has the spiritual and historical authority of Constantinople, and Anagnostopoulos stresses Halki’s “ecumenical” nature. “The Patriarch wants the graduates to go out into the world not from a Greek institution, but from a global, supranational one,” he says. The following morning I have an audience with Bartholomew I. The Patriarchate shelters behind stone walls in Fener, a former Rum quarter on the Golden Horn now largely abandoned to Anatolian squatters. Dressed modestly in black robes, his only adornment a neck chain with an icon of the Virgin and Child, His All-Holiness welcomes me to his wood-panelled office. The glittery chandelier, the crimson carpet and his frothy white beard remind me of Santa’s grotto. Indeed, like Bartholomew, St Nicholas was a Greek born in Asia Minor; and coincidentally, given the seminary debacle, he is also the patron saint of students in some countries, including Greece. But Bartholomew is no cuddly Father Christmas; he has a reputation for being tough and shrewd, as well as scholarly. He tells me that his mission as Patriarch today is the same as in my great-grandfather’s day – to serve the eastern churches – but that the circumstances are very different. “It’s been difficult under the Turkish republic. Very difficult.” Since taking office in 1991, he has battled for the Rum and Halki. In a worldweary voice, he describes the closure of his alma mater as “offending human dignity”. There is something of the holy martyr about this elderly man negotiating the minefield of Turkish politics. But Bartholomew is now rising above local and Greek national issues and becoming a high-profile campaigner for the environment, as well as a mediator between east and west, Muslim and Christian. Making a virtue of his position as an ethnic Greek of Turkish nationality, speaking seven languages and living in the only city in the world that straddles two continents, he has visited more Muslim religious and political leaders than any other Christian leader. Ziya Meral, a Turkish academic and writer, tells me that Bartholomew is respected throughout Turkey as a peacemaker. Other Christian sects, which lack EU and US backing or a spokesperson of the Patriarch’s stature, continue to suffer. Last December a group of Muslims with links to Hezbollah reportedly threatened to kill the priest of a Syriac Orthodox church in Diyarbakir in south-eastern Turkey unless he pulled down its 250-year-old bell tower. This was in response to a referendum in Switzerland that banned the construction of new minarets there, provoking accusations of Islamophobia in the Turkish press. The priest was given police protection and his bell tower is still standing. Nevertheless, the threat may reflect wider attitudes in Turkey. According to World Watch Monitor, a news agency reporting from the front line of Christianity, a 2009 study by researchers from Sabanci University in Istanbul found that 59 per cent of those surveyed believed that non-Muslims should not be allowed to hold open meetings to discuss their ideas, and almost 40 per cent confessed to having negative views of Christians, who they feared intend to divide the country. A Protestant pastor in Kocaeli Province, north-western Turkey, has endured death threats for over a year; in mid-January police foiled an assassination attempt against him. So, it is surprising to hear Bartholomew declare that things have improved. Tensions between Greece and Turkey eased when they shared assistance after the 1999 earthquakes that rocked Istanbul and Athens, and Greece supports Turkey’s accession to the EU. Erdogan is also thought to recognise that the Rum exodus has diminished Istanbul’s business flair; in an attempt to lure the Rum back, he is returning some confiscated properties and offering to restore Turkish citizenship to exiles, more and more of whom, unable to find work in Greece, view Turkey as an attractive prospect. And in 2010, he modified the laws on Turkish nationality and allowed any bishop under Bartholomew’s jurisdiction to apply for citizenship, greatly increasing the numbers of potential candidates for the patriarchy. It is an irony that the pro-Muslim government has proved more sympathetic towards Christians – and religion in general – than any other since the Turkish republic was founded. Between 2005 and 2008, attacks against Christians increased, but secular Kemalists were reportedly to blame. Ziya Meral, who is a Christian, argues that the AKP is less Islamist than conservative Muslim, in pursuit of a liberal market economy and integration into the global systems together with a desire to protect old Turkish values. The AKP’s reforms, and its efforts to convey openness, may signal Turkey’s continued desire to join the EU. It was thought that Erdogan, previously rebuffed by France and Cyprus, was turning away from the west to build closer economic and diplomatic ties with the Middle East and Russia. But with neighbouring Syria in chaos and growing tensions with Iran, Turkey seems to be returning to the Nato and EU fold. In this context, Barack Obama, lobbied by powerful Greek-American archons, or community leaders, who include members of Congress, raised the Halki question in March 2012. Erdogan – keen to maintain his credentials as a reformist moderate – replied that he saw no reason why the seminary should not reopen. His optimism could prove premature. According to the English-language newspaper Today’s Zaman, the Turkish people are in favour of reopening Halki but Erdogan would need to change the Turkish constitution – which would run into opposition from nationalist parties and his own AKP. Some fear Christian separatists and some fear Greek nationalist ambitions, while others claim that it would allow Muslim extremists to open their own hate-filled madrasas. In May, violent unrest involving secularists erupted in Turkey’s main cities. There is also the problem of reciprocity, by which the 1923 Treaty of Lausanne safeguards the religious freedoms not only of the Rum in Turkey but also of the 100,000 Muslims, mostly of Turkish origin, who stayed behind in Greece. A Greek-born Turk now living in Istanbul points out that while the Rum have their Patriarch, who lives “like a king” in Istanbul, the Greek Muslims are not even allowed to elect their own mufti, their spiritual and legal leader, and have to endure one imposed by the Greek government, whom they don’t respect. “Halki should reopen when Athens has an official mosque,” he also says. It is the only western European capital without one. Opening a mosque in Athens is not in Bartholomew’s power. Although he enjoys huge support in Greece, the Greek Church is independent and he has only restricted authority over a part of the country. Besides, he knows how unwise it is to involve himself in Greco-Turkish politics. So, will Halki seminary rise from the grave? That remains to be seen. As the professor and I bid farewell to Father Samuel in the colonnaded hall, the Greek priests finish tea and descend the staircase. The three younger priests, abundantly bearded, support two wizened older fathers. One is short and plump, with a freckled scalp and wispy hair caught in a bun, and glued to his lower lip is a toothpick that rests on his grey beard. After much polite hand-shaking, they climb into their carriage and trot back down the Hill of Hope.